(Nanowerk News) For the first time, scientists have discovered how to produce ultra-thin "diamond nanothreads" that promise extraordinary properties, including strength and stiffness greater than that of today's strongest nanotubes and polymers. A paper describing this discovery by a research team led by John V. Badding, a professor of chemistry at Penn State University, has been published in Nature Materials ("Benzene-derived carbon nanothreads"). "From a fundamental-science point of view, our discovery is intriguing because the threads we formed have a structure that has never been seen before," Badding said. 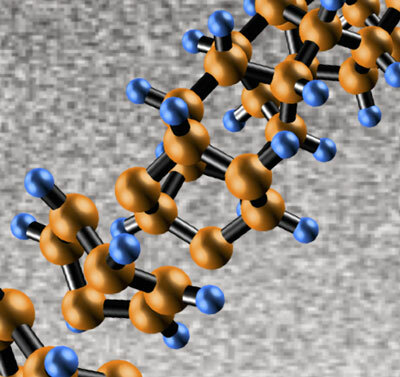 The core of the nanothreads that Badding's team made is a long, thin strand of carbon atoms arranged just like the fundamental unit of a diamond's structure -- zig-zag “cyclohexane” rings of six carbon atoms bound together, in which each carbon is surrounded by others in the strong triangular-pyramid shape of a tetrahedron. "It is as if an incredible jeweler has strung together the smallest possible diamonds into a long miniature necklace," Badding said. "Because this thread is diamond at heart, we expect that it will prove to be extraordinarily stiff, extraordinarily strong, and extraordinarily useful." The team's discovery comes after nearly a century of failed attempts by other labs to compress separate carbon-containing molecules like liquid benzene into an ordered, diamondlike nanomaterial. "We used the large high-pressure Paris-Edinburgh device at Oak Ridge National Laboratory to compress a 6-millimeter-wide amount of benzene -- a gigantic amount compared with previous experiments," said Malcolm Guthrie of the Carnegie Institution for Science, a coauthor of the research paper. "We discovered that slowly releasing the pressure after sufficient compression at normal room temperature gave the carbon atoms the time they needed to react with each other and to link up in a highly ordered chain of single-file carbon tetrahedrons, forming these diamond-core nanothreads." Badding's team is the first to coax molecules containing carbon atoms to form the strong tetrahedron shape, then link each tetrahedron end to end to form a long, thin nanothread. He describes the thread's width as phenomenally small, only a few atoms across, hundreds of thousands of times smaller than an optical fiber, enormously thinner that an average human hair. "Theory by our co-author Vin Crespi suggests that this is potentially the strongest, stiffest material possible, while also being light in weight," he said. The molecule they compressed is benzene -- a flat ring containing six carbon atoms and six hydrogen atoms. The resulting diamond-core nanothread is surrounded by a halo of hydrogen atoms. During the compression process, the scientists report, the flat benzene molecules stack together, bend, and break apart. Then, as the researchers slowly release the pressure, the atoms reconnect in an entirely different yet very orderly way. The result is a structure that has carbon in the tetrahedral configuration of diamond with hydrogens hanging out to the side and each tetrahedron bonded with another to form a long, thin, nanothread. "It really is surprising that this kind of organization happens," Badding said. "That the atoms of the benzene molecules link themselves together at room temperature to make a thread is shocking to chemists and physicists. Considering earlier experiments, we think that, when the benzene molecule breaks under very high pressure, its atoms want to grab onto something else but they can’t move around because the pressure removes all the space between them. This benzene then becomes highly reactive so that, when we release the pressure very slowly, an orderly polymerization reaction happens that forms the diamond-core nanothread." The scientists confirmed the structure of their diamond nanothreads with a number of techniques at Penn State, Oak Ridge, Arizona State University, and the Carnegie Institution for Science, including X-ray diffraction, neutron diffraction, Raman spectroscopy, first-principle calculations, transmission electron microscopy, and solid-state nuclear magnetic resonance (NMR). Parts of these first diamond nanothreads appear to be somewhat less than perfect, so improving their structure is a continuing goal of Badding's research program. He also wants to discover how to make more of them. "The high pressures that we used to make the first diamond nanothread material limit our production capacity to only a couple of cubic millimeters at a time, so we are not yet making enough of it to be useful on an industrial scale," Badding said. "One of our science goals is to remove that limitation by figuring out the chemistry necessary to make these diamond nanothreads under more practical conditions." Potential applications that most interest Badding are those that would be vastly improved by having exceedingly strong, stiff, and light materials -- especially those that could help to protect the atmosphere, including lighter, more fuel-efficient, and therefore less-polluting vehicles. "One of our wildest dreams for the nanomaterials we are developing is that they could be used to make the super-strong, lightweight cables that would make possible the construction of a "space elevator" which so far has existed only as a science-fiction idea," Badding said.